Having proper running shoes is extremely important. Running is a very labor intensive activity that can result in injury and discomfort. 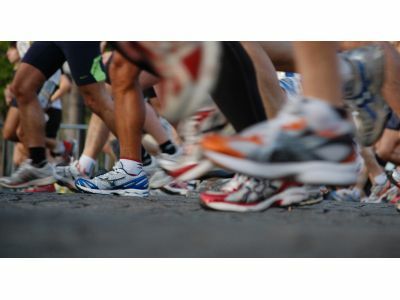 The absolute best way to protect yourself is with the perfect pair of running shoes for your feet and activity level. In this post we will look at three tips to keep in mind when you’re picking out new running shoes. Buying running shoes does not necessarily have to be an all-day event, but it’s important you leave yourself with enough time to check out all of your options and do any necessary measuring. Take your time talking to sales associates about your specific needs and desires in a running shoe. It’s also a good idea to do your shoe shopping later in the day. Our feet tend to swell a bit after we’ve been on them for awhile, so shoes that may fit in the morning will be too tight by evening. Most people who run have specific socks they wear while running. Running socks are sometimes a bit thicker than normal, everyday socks. It’s important to try on the running shoes with the socks you will be wearing when you use them. Even a slight difference in thickness of your socks can make a difference in the shoes that you buy. Most people think they know their foot size, when in fact they have never had their feet measured. The right show size can also vary based on the brand and style of shoe. When you’re having your feet measured, be sure to look at both the length and the width – they are equally important. At Corey’s Bootery in Kalamazoo, we have been a family-owned local business since we opened almost 45 years ago. Our staff is not made up of just sales associates – we have three certified Pedorthists and are an ABC Accredited Facility. If you have been looking for high quality running shoes in Kalamazoo or any other type of footwear, contact us or stop in today!